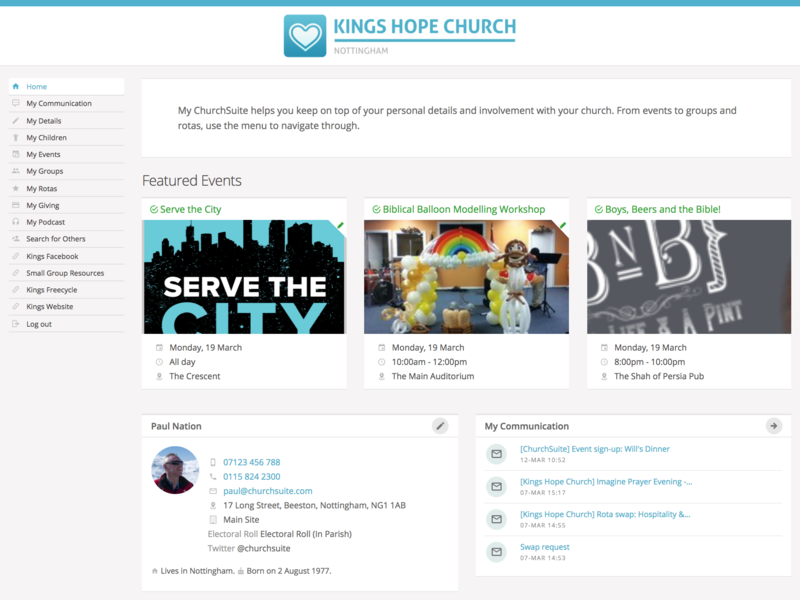 My ChurchSuite is ChurchSuite's member-facing platform and it's the ideal way to help your church community to stay connected to one another and keep up to date with all that’s going on in the life of your church. 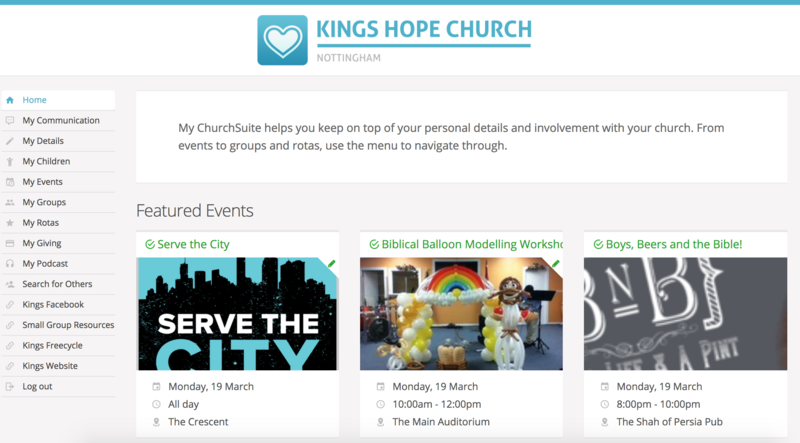 Through My ChurchSuite, people are able to manage their own personal details and keep them up to date, sign-up for events, join small groups, keep on top of the rotas they’re serving on and much more! Parents can even manage their children's personal details. Access to My ChurchSuite is via an invitation initiated from ChurchSuite Address Book, so you can easily manage who is to have access to suit your church context. My ChurchSuite can be easily customised and styled for your church, providing a familiar experience to your church members. My ChurchSuite is accessible from any web browser, or using our free iOS or Android apps. 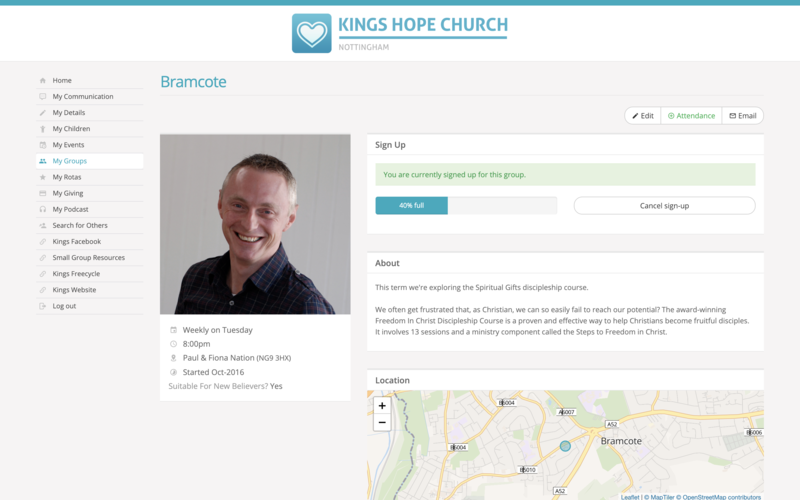 The first part of My ChurchSuite that your church members will see after logging in is the Home page, where a customisable welcome message greets them. 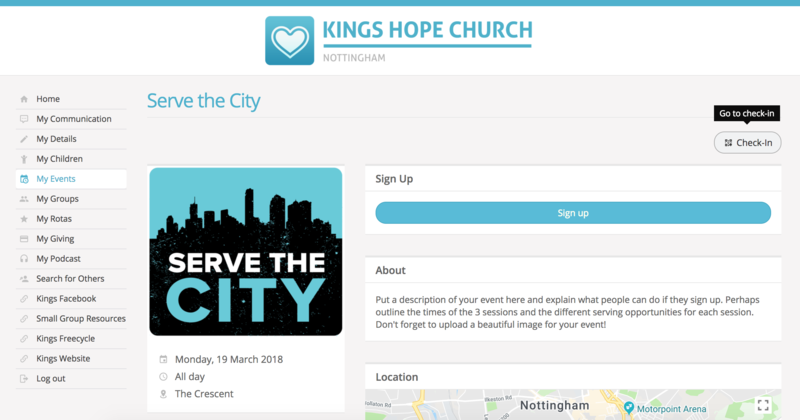 The next three upcoming Featured Events are also displayed on the Home page, making My ChurchSuite a fantastic way to let your church members know about the high profile upcoming events at your church! They can then click through to the event's page to see further information about the event and even sign-up (where event sign-up is enabled). The Home page also contains a mini version of the My Communication section, listing the most recent communications sent to them through ChurchSuite. Essentially people can view all their church communications in one place (as well as receiving them on their regular email application of course). Clicking through to My Details from the Home page or the My Details menu option, members are able to manage and update their personal details (address, phone numbers, email, etc) as well as a few other key pieces of information about themselves. This gives your church members a degree of ownership over their data, while reducing your administrative burden - a win-win situation! Members can easily manage their Privacy settings too; to choose which pieces of contact information they are happy to be visible to other church members within My ChurchSuite; they can share as much or as little as they feel comfortable. Note that the privacy options only extend to a member's address, telephone, mobile and email - no other personal details are visible to others in My ChurchSuite, and no children details are visible either. Church members can also click to view your church's data protection message or Privacy Notice and they have the option to Delete account, if they wish. 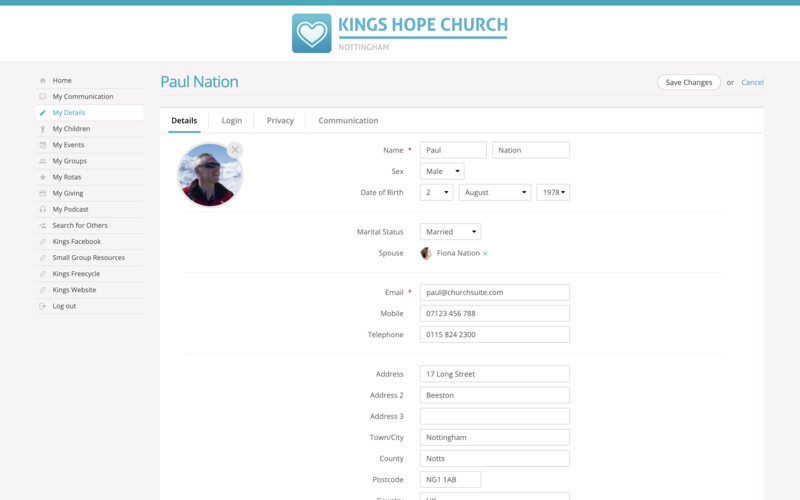 The Communication tab is for managing their communication options - whether they wish to opt in or out of your church's various communication methods. 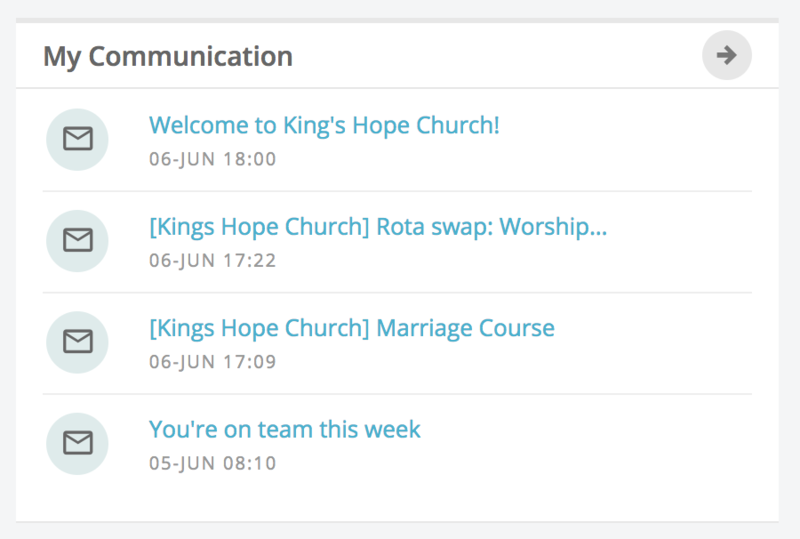 The My Communication page displays a list of all communications sent to that person through ChurchSuite - most often in the form of emails or SMS messages - to see all their church communications in one place. My Communication displays communications for the last six months, with a maximum of 50 items (whichever is fewer). Selecting any communication will open the item to view. Note: It's not possible to dismiss or hide 'read' communications - in this regard the My Communications section is not a mail folder. 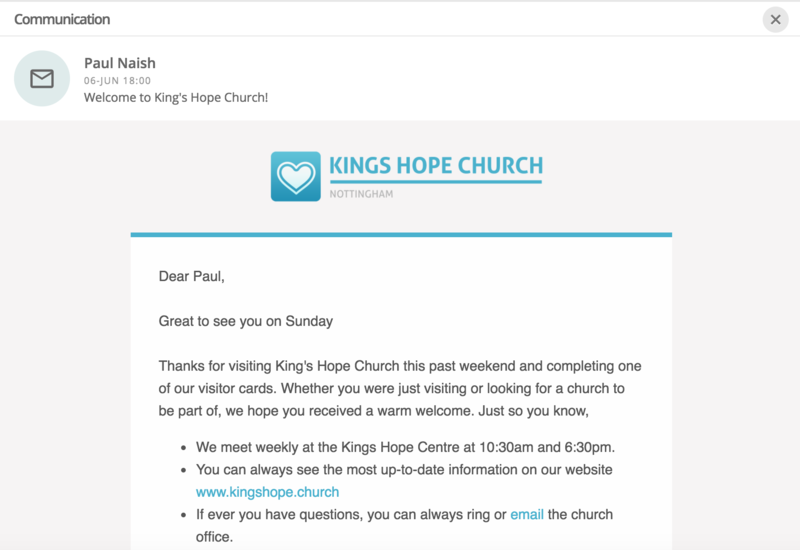 It's also not possible to reply to emails from within My ChurchSuite - church members would still use their regular email applications to send replies. The My Children section allows parents to manage their children's details. 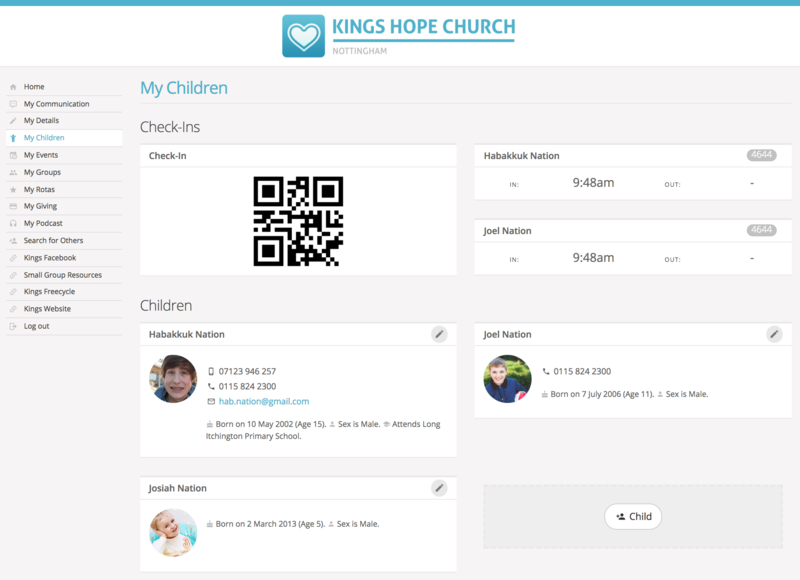 Only a parent can view their own [linked] children’s details - church members who do not have children will not see the My Children section in their My ChurchSuite profile. During an active child Check-In session, a check-in QR code is shown on the My Children page that can be scanned by a QR code scanner at your check-in point to help parents quickly locate all their children within the check-in system and check them in quickly and intuitively. Once checked in, parent pick up badges are also shown on the My Children page - parents can even see if a child has already been checked out; perhaps to see if the child was collected by the other parent. Clicking through into a child's Details page gives parents the option to manage that child's information, including contact details and important medical and special needs information. 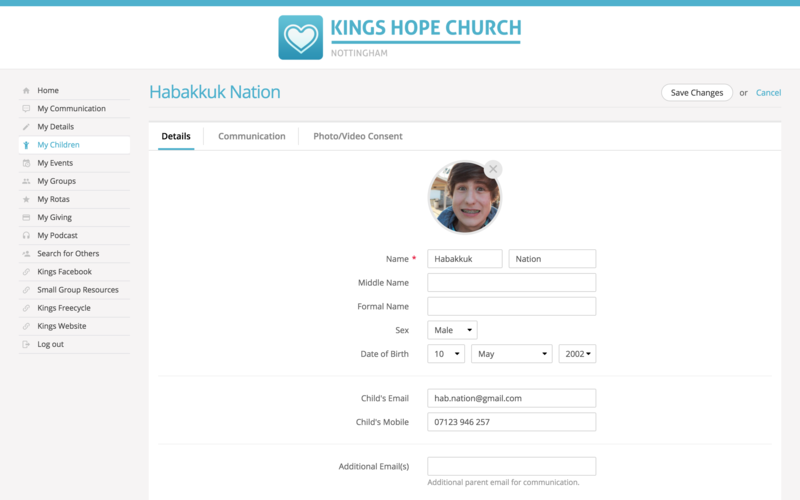 The Communication tab is home to the child's communication options and whether they are opted in or out of your church's various communication methods. ...and the Photo/Video Consent tab includes the settings for the child's photo/video consents for internal and external presentation. 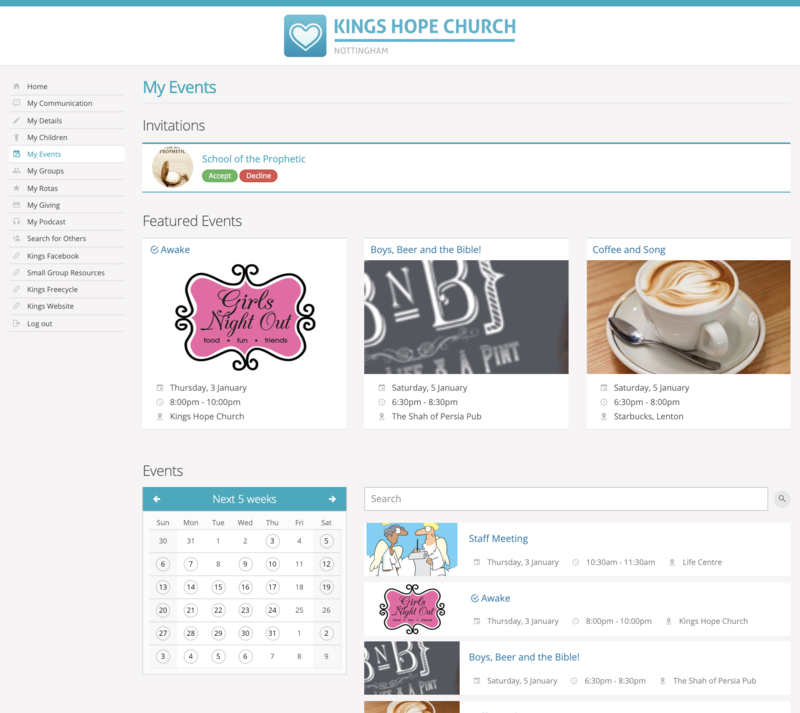 The My Events section provides your church members with a simple, searchable event calendar that lists all your public-facing upcoming church events, courses and meetings. Any events marked in the Calendar module as Visible in My ChurchSuite will show on the My Events calendar. Outstanding event Invitations and the next 3 upcoming Featured Events are also shown. Clicking on any event takes you through to the event's page, which includes all the details of that particular event; including date, time, the location where it’s being held (as well as a handy embedded map to help them find their way) and a short description of the event itself. 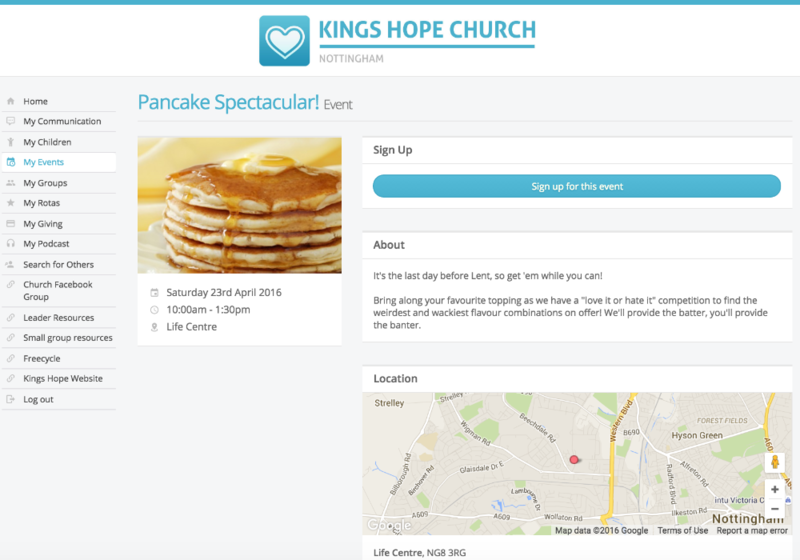 Events can also be set up to allow people to sign-up through My ChurchSuite - making it easier than ever for members to engage and participate in your church's events. 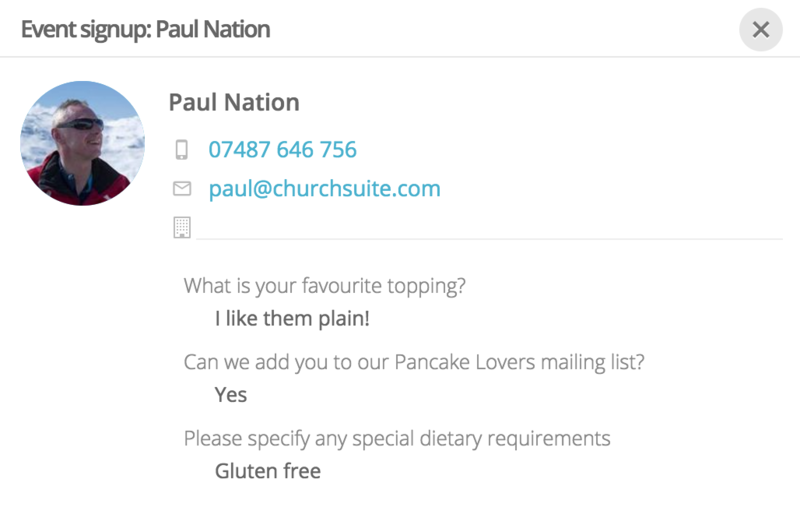 When a church member clicks to sign-up through My ChurchSuite, their contact details are even pre-populated into the sign-up form! ...and then click through to see the contact details of sign-ups, including the responses to any event questions completed at the point of signup. 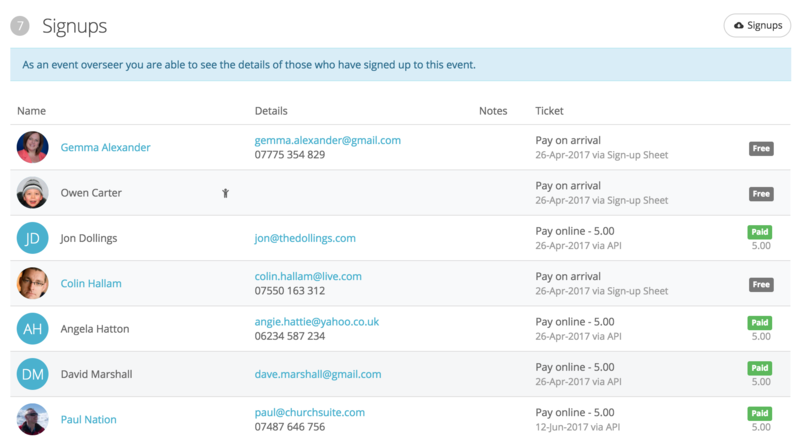 Event overseers can also access ChurchSuite's event Check-In system to record attendance at their event. The My Groups section has a number of features. Firstly, group members can see the contact details of their fellow small group members (subject to each member's privacy settings). 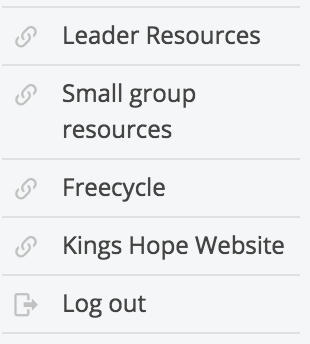 Secondly, you can optionally enable "role" permissions so that those in a particular small group member role, e.g. leaders, are able to submit attendance for their group and manage the group's details. 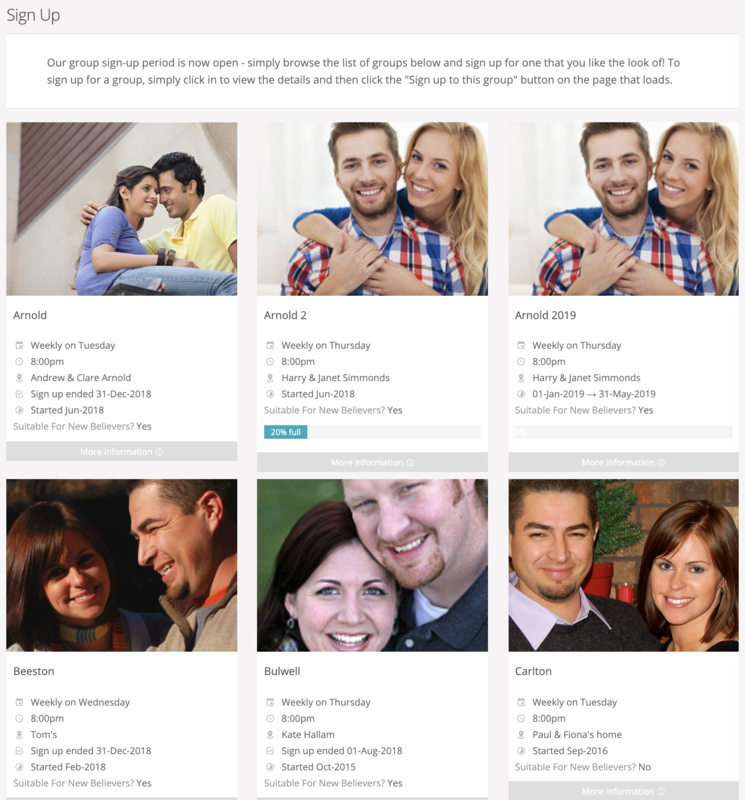 The My Groups section is great for those not yet in a small group too! You can easily display a list of groups that are open for Sign Up. Those looking for a small group to join can peruse the list, select a group that's right for them and sign-up in a single click - and the group's leaders get a notification too! We've made it really easy for small group members to easily communicate with one another using a simple Group email feature. When a group email is sent out it goes to all the members whose contacts are listed in that particular small group. The author can even set whether replies come back just to them, or get sent to all the members of that small group. This means an end to the perpetual round-robin of emails, replies and updates that occurs when communicating with a group of people; now you just send out one group email and the replies can be visible to all parties automatically. 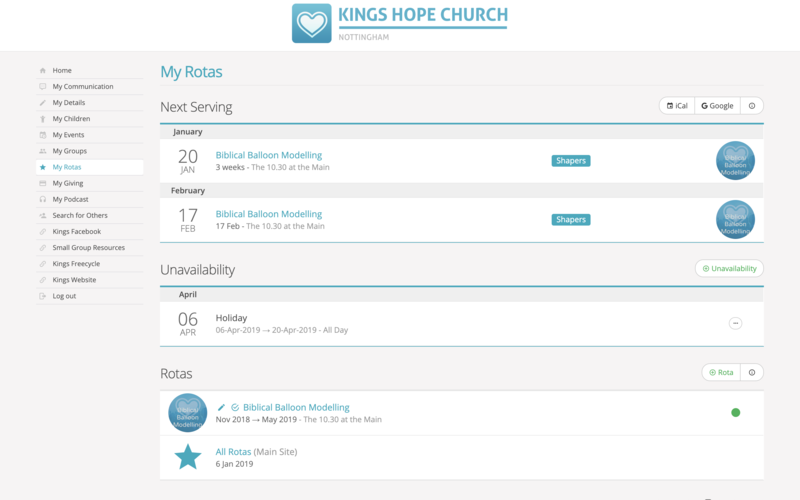 The My Rotas section enables church members to quickly and easily view all their rotas and upcoming serving commitments in one place. 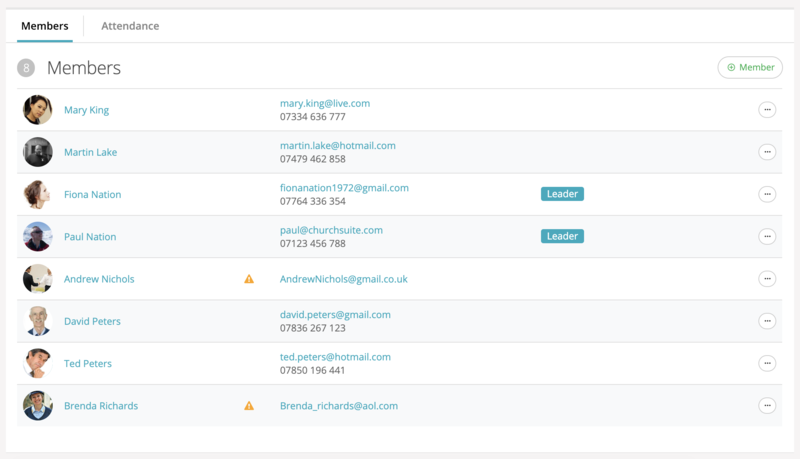 As with our My Groups section, My Rotas affords your members the ability to contact everyone on their rota at once using our rota Group email feature, and rota members are also able to arrange and process Swaps and add their Unavailability. Rota overseers will also love the My Rotas section too! Overseers can create, publish distribute and manage rotas all from within My ChurchSuite, without needing access to your ChurchSuite Rotas module. Whether it's managing their teams and roles, or emailing out a new rota, My Rotas helps everyone stay up to date with who's doing what and when. The My Giving section makes it simple for your church members to engage with their giving by placing the ability to effectively manage their donations directly at their fingertips. 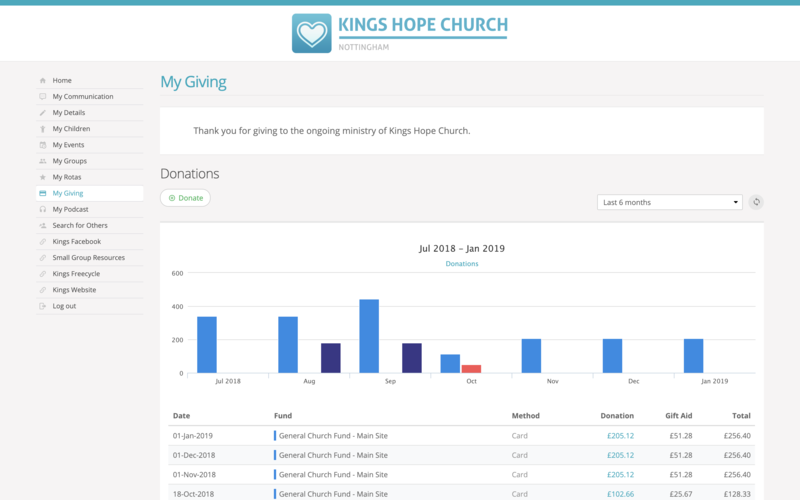 Through My Giving people are able to make one-off and recurring online donations using ChurchSuite's online giving platform called Donate, as well as reviewing the donations that they have made to your church by other methods. Church members are also able to make Gift Aid declarations (UK churches only), ensuring that you will be able to claim Gift Aid for the donations that they make to your church. Lastly, My Giving allows your members to set up and manage Pledges for you various church funds. My Giving will then track the value of that pledge as it is fulfilled and will use a progress bar to display the amount remaining. If your church records podcasts of your services you can now make them available to your members directly through My ChurchSuite! 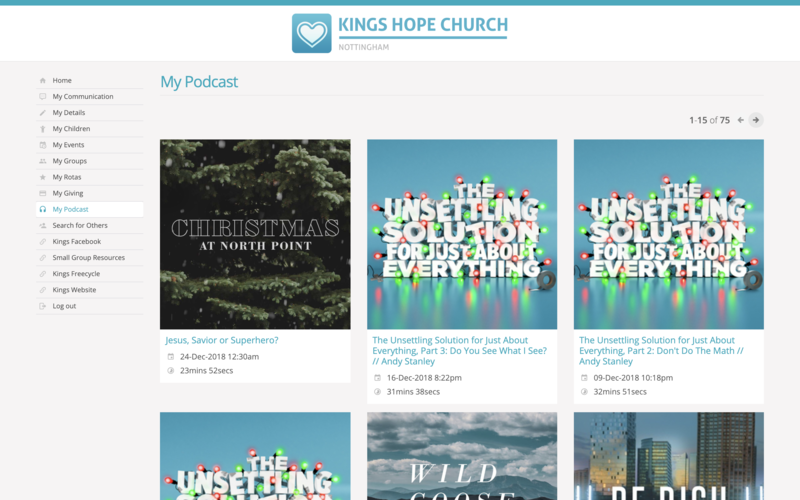 This fantastic feature allows you to link your ChurchSuite account to either an XML/iTunes feed or SoundCloud ID and have any podcasts uploaded using these services appear within My Podcasts - you can even have services in a series listed together! If you record videos of your services and upload them to either a Youtube or Vimeo account, you can also include your video alongside the audio player. 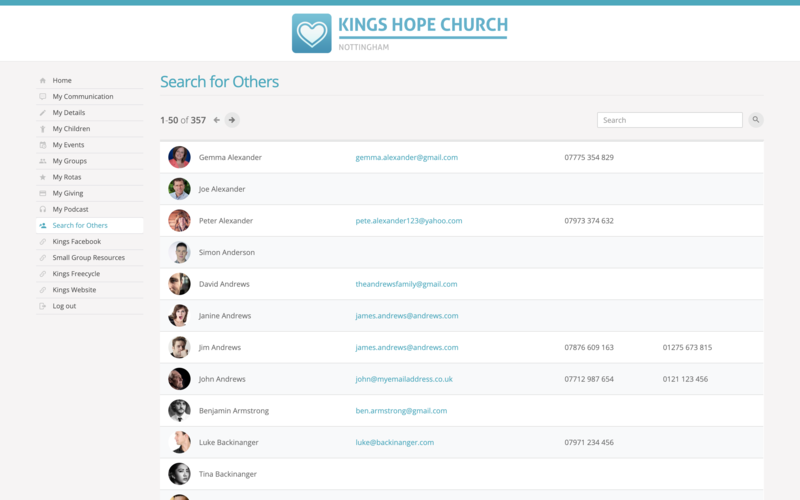 Search for Others is your church contact directory; enabling church members to look up contact details of other church members without having to burden the church office or find their out-of-date printed church directory. Church members can only see information that people choose to make visible through their privacy settings, and importantly, no children information is included in the directory. This feature, if enabled, can be either made available to all My ChurchSuite church members, or restricted to church members who are in a particular Tag e.g. "Members". In addition to the system navigation menus provided in My ChurchSuite as outlined above, you can also add your own custom external links. These are great for linking to your own website, church social media groups, mission links, prayer chains, dropbox storage etc. 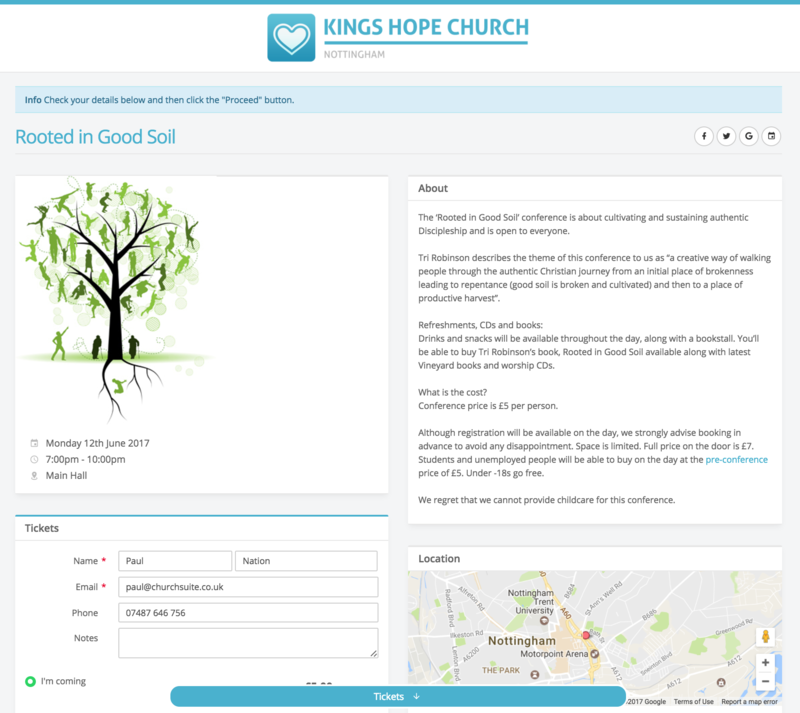 You can even set custom menus to only be visible to church members in a particular tag - ideal for making resources available to certain groupings of people. We are constantly looking for ways to improve My ChurchSuite, to provide your church members with the best system possible. More than anything else My ChurchSuite is geared towards helping your members to become more connected in your church by making it as simple as possible for them to take control and become involved in all that your church community offers.